eVision offers an advanced site design methodology called Conversion Point Architecture that we have been developing for a couple of years. With Conversion Point Architecture we can significantly improve a web site’s conversion rate whether it is measured in sales, signups, information delivery or whatever constitutes a “win” on the site. The Conversion Point Architecture strategy draws from many fields including psychology, the usability field, web-buying behavior research and web technology and typically includes usability/conversion rate evaluations, target audience analysis, defining site objectives, user testing, advanced site analytics, complete content reviews, site architecture design, and site development.. Most clients see returns of from $10 to $100 or more for every dollar invested in a conversion rate improvement project. For more information about the Conversion Point Architecture methodology see this post in our blog, eVision announces trademarked site design methodology to improve web site conversion rates: Conversion Point Architecture. Here’s a case study of actual results seen during a project. During this approximately 15 month project we helped redesign the site for both improved conversions (sales and leads) and organic search engine results. This site was not in terrible shape. It was actually paying off pretty well. However, Todd Follansbee, an eVision Usability & Design Consultant (See our About Us page for more about Todd) helped them rethink the site’s content, organization etc. This is a non profit professional membership organization. There are 4 or 5 key goals (conversion points on the site) that we worked on. The two most important goals, of course, are the money goals, the membership signups and the sales of books and courses. The site was relaunched in March 2007. Look at the conversion numbers shoot up in April after the new site was launched. The conversion rate more than doubled after the relaunch. Conversion rates continued to increase in later months as we continued making tweaks to the site’s conversion funnels etc. By October 2007 the conversion rate had increased by more than 300%, that’s 3 times what it was before the site was relaunched. We focused on 4 key goals on the site, the two money goals and two goals that lead to future sales – a newsletter signup and an important document download. At last check in October 2007 the overall conversion rate for the site (the combination of the 4 goals we are tracking) was 20%! That’s correct 20%. That means that 1 in 5 visitors to their site are converting in one of more of the 4 goals – becoming a member, buying a book or course, signing up for the newsletter or downloading that document. In addition their search engine rankings have improved and organic search traffic is a now a significant amount of their total referral traffic. Try to estimate what this kind of conversion rate improvement could me for your business. For example, let’s assume your web site’s overall conversion rate is 1%. To keep the math simple lets assume the site is an eCommerce site where sales are the most important conversion (If it’s a lead generation site you’ll need to add the typical number of leads needed to result in a sale into the calculation). Now assume your web site currently converts an average 10,000 visitors per month to the site into sales at a 1% conversion rate. That’s 100 sales. Let’s assume your average sales revenue is $200 and you make 50% gross profit on average. That’s $100 in gross profit per sale. So those 100 sales you currently get from the web site each month result in about $10,000 a month in gross profit or about $120,000 in gross profit per year (100 sales X $100 in gross profit = $10,000 gross profit per month x 12 months = $120,000 gross profit per year). Let’s look at what it would mean to you if the conversion rate on the web site was increased by 300%. Those same 10,000 visitors per month that resulted in 100 sales at a 1% conversion rate would now results in 300 sales at a 3% conversion rate. Those 300 sales would results in about $30,000 a month in gross profit or about $360,000 in gross profit per year. In other words by improving the conversion rate on the site by 300% your gross profit over the course of a year grew from $120,000 to $360,000 dollars. You tripled your gross profit and generated an additional $240,000 dollars in gross profit just by improving the conversation rate! Let’s look at the Return on Investment for your project. It would not be unusual for a Conversion Point Architecture site redesign project to cost anywhere from about $15,000 to about $100,000. Let’s assume your Conversion Point Architecture site redesign project cost $50,000. Take a look at the potential ROI on your own web site with some real numbers and be conservative. If your site has never been tested and worked on to improve conversion rates than see what the numbers look like if we can improve the conversion rate by double, or 200%. If you have done some testing and conversion rate improvements on the site then you should be even more conservative. What if we can improve the conversion rates by about 10% or 20%? In this example we only looked at improving the conversion rates. In most design projects we also work on redesigning the site to improve search results. This is followed by a continuing effort to improve search traffic after the site is relaunched. So you could also perform some “what if” ROI calculations on additional traffic to the site too. What if we can increase organic search traffic by 50% or 100% etc in addition to improving the conversion rates? What would that mean to the bottom line and the ROI? 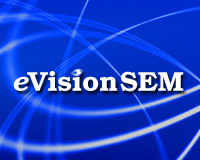 For more information about the Conversion Point Architecture methodology see this post in our blog, eVision announces trademarked site design methodology to improve web site conversion rates: Conversion Point Architecture.